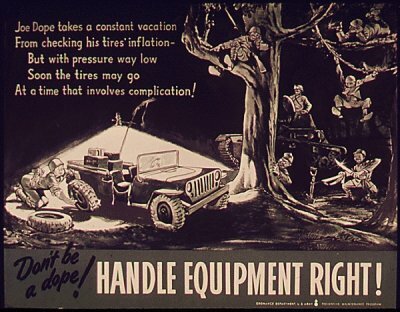 Home /Don’t Be A Dope! 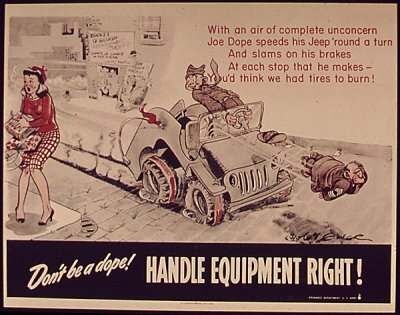 Joe Dope was the unsung anti-hero of WW2. His job was to show the troops the WRONG way to do something. Hopefully, they would get the right idea by his bad example. 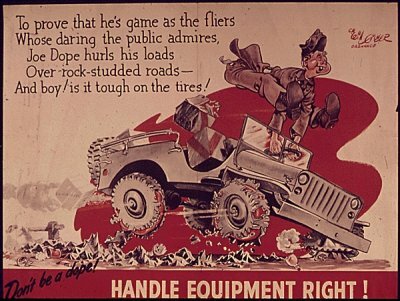 Except for a jeep or two, I’m pretty sure none of the jeeps can stop THAT fast, but you get the message. Just because you CAN doesn’t mean you should! 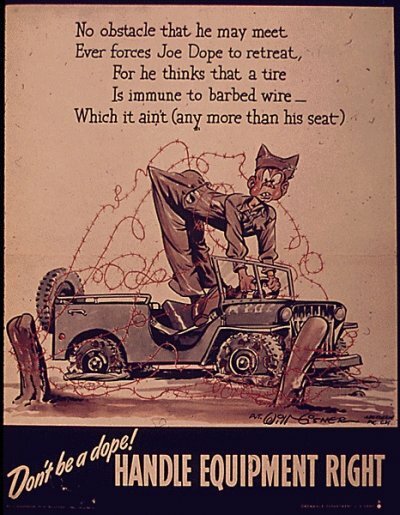 Taking it easy in an old jeep is the best way to get there…both of you in one pieces. When going off-road the best policy is to take it EASY. Sure the MB/GPW will go anywhere but you need to bear in mind that it is 60 more years old…no need to give the ol’ gal a heart attack. What can I say? 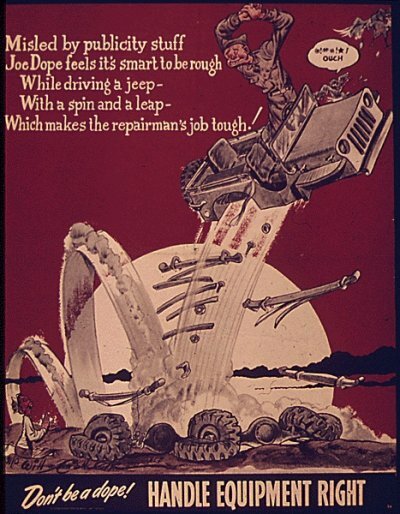 To paraphrase Clint Eastwood…a man has got to know his limitations and that of his jeep. This last picture is just as true today as it was during the war. 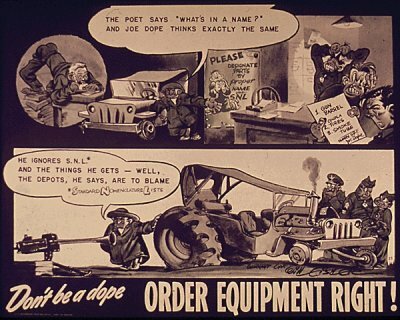 If you just purchased your jeep or are an old hand, it helps to know what you are ordering. It makes the vendors job easier and it will make you happier to actually get what you THOUGHT you ordered. Get a copy of the Standard Nomenclature List for the jeep and it wouldn’t hurt to get the other lists as well. The SNL has a lot of illustrations that will help you identify the part you are ordering. It makes life easier and cuts down on postage. And for heaven’s sake if you don’t have TMs 9-803, 9-1803A and 9-1803B and you OWN a MB/GPW—WHAT ARE YOU WAITIN’ FOR? Get a reprint or CD version today.